This is a nice treat for your kids after school or as a snack during the day, plus easy to make with them. Show them all about being in the kitchen cooking with this Crunchy Peanut Butter Mix over on Betty Crocker! I wonder…would Puppy Chow made with Golden Grahams taste like S’more’s??? 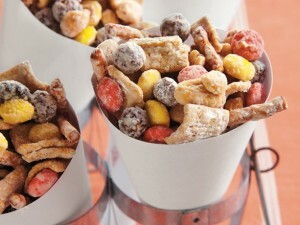 This recipe makes me think it could…mini chocolate chips & diced mini mallows…yum! Wish family was awake so I could try without waking them!